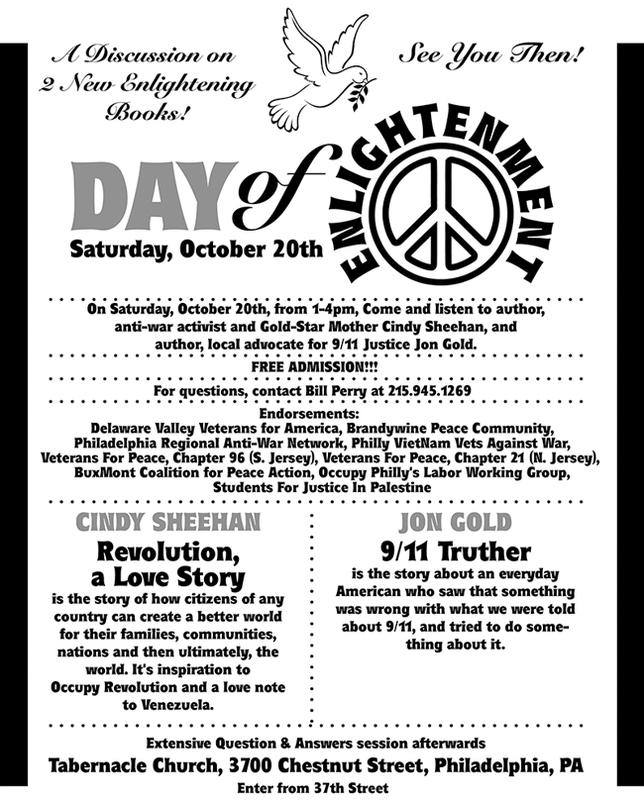 On Saturday, October 20th, from 1-4pm, Come and listen to author, anti-war activist and Gold-Star Mother Cindy Sheehan, and author, local advocate for 9/11 Justice Jon Gold. Cindy will talk about her latest book. Revolution: A Love Story. Revolution: A Love Story is the story of how citizens of any country can create a better world for their families, communities, nations and then ultimately, the world. It’s inspiration to Occupy Revolution and a love note to Venezuela. Jon will talk about his book, 9/11 Truther. 9/11 Truther is a story about an everyday American who saw that something was wrong with what we were told about 9/11 and tried to do something about it. For questions, contact Bill Perry at 215 945 1269. Be sure to use the 37th Street Entrance.